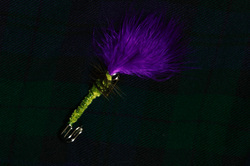 The Kilt Pins featured here are augmentation of Fly-Fishing Flies that have a strong Scottish Flair. The Royal Standard of Scotland, also known as the Lion Rampant of Scotland, is the official standard and arms of the sovereign of Scotland. Even though it's improper for an individual who is not a representative of the Crown to display the Lion Rampant, show everyone around that you are still the king in your kilt. According to legend, a Norse army was attempting to sneak up at night upon a Scottish army's encampment. 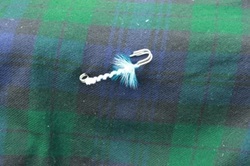 During this operation one barefoot Norseman had the misfortune to step upon a thistle, causing him to cry out in pain, thus alerting the Scots to the presence of the Norse invaders. 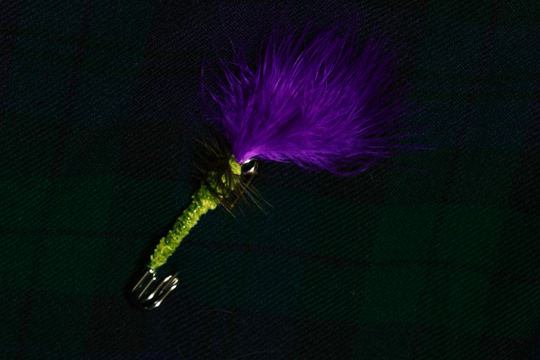 Keep your kilt under the protection of your own Thistle. According to legend, in 832 A.D. Oengus II led an army of Picts and Scots into battle against the Angles, led by Æthelstan, near modern-day Athelstaneford, East Lothian. The legend states that whilst engaged in prayer on the eve of battle, Óengus vowed that if granted victory he would appoint Saint Andrew as the Patron Saint of Scotland; Andrew then appeared to Óengus that night in a dream and assured him of victory. On the morning of battle white clouds, forming an X shape in the sky, were said to have appeared. Óengus and his combined force, emboldened by this apparent divine intervention, took to the field and despite being inferior in terms of numbers were victorious. Having interpreted the cloud phenomenon as representing the crux decussata upon which Saint Andrew was crucified, Óengus honoured his pre-battle pledge and duly appointed Saint Andrew as the Patron Saint of Scotland. The white saltire set against a celestial blue background is said to have been adopted as the design of the flag of Scotland on the basis of this legend.